El Cortijo del Pino is an agricultural building built in the late S. XIX. It is located in a growing area 3 km from the city of Granada. The main body of the house is square and is structured around a central patio stone columns. The main building was annexed other buildings dedicated to agricultural uses. The restoration of the house has been respetanto the most of the typology of the area, existing materials and character of the place. At present there are 4 apartments that are offered in the Cortijo del Pino for occupancy from 2-5 people. The interiors with terracotta floors, handmade tiles and wooden ceilings, and the beautiful outdoor gardens with large trees and swimming pool. There is also a large placeta in front of the house as parking. The Cortijo del Pino maintains its agricultural activity where a farm of 2 hectares of fruit trees with ecological management is cultivated, whose production is sold through short channels to different consumption groups in the city of Granada through the web manager www. valleyvega. org Our customers can also buy some packaged organic products from small initiatives of farmers in the province of Granada: honey from the Alpujarra, oil from Alomartes, subtropical fruit marmalades from the coast, canned from the west or dried from the Altiplano. We also have several bicycles we provide to our customers based on availability. With them you can stroll through the Vega or equipment moves into town. Recently it has opened a bike path, which enables travel to Granada, safely, in just 15 minutes. Bathroom with shower. Fajalauza kind handmade tiles. It includes basic bath: toilet paper and soap. The pool towels must bring the guests. Nous avons passé une excellente semaine dans cette maison. Concha, bienveillante et attentionnée , nous a accompagnés au mieux avant et pendant notre séjour. Le site est très calme et proche de Grenade. Notre gîte typiquement espagnol était d un confort absolu. Un grand merci à Concha et Virginia qui nous ont montrés que le sourire est héréditaire..
Très bon accueil de la part de Concha. Un gîte où nous avons manqué de rien : la maison est fraîche, les lits très confortables, la terrasse ombragée, la piscine grande, les bains de soleil reposants, un environnement très calme aux portes de Grenade...Les enfants ont également beaucoup apprécié la ferme. Notre hôtesse était à nos petits soins : linge de maison renouvelé en milieu de semaine. Elle propose également l'achat de produits locaux. Tout était parfait. Wir haben uns hier super wohl gefühlt. Die Unterkunft ist stilvoll und gemütlich eingerichtet. Concha ist eine tolle Gastgeberin, die jederzeit ein offenes Ohr für alle Fragen hat. Cette résidence présente l'avantage du charme d'une ancienne hacienda avec un grand confort, dans un environnement de campagne, tout en étant à proximité de Grenade. Concha nous accueille chaleureusement et accompagne notre séjour de conseils avisés. El Cortijo del Pino is located in the Vega of Granada agrological a region of great value. It is located about 3 km from Granada making it an ideal place to enjoy all the cultural offerings of the city in an agricultural setting where you can appreciate and share the work and way of life rural enclave. 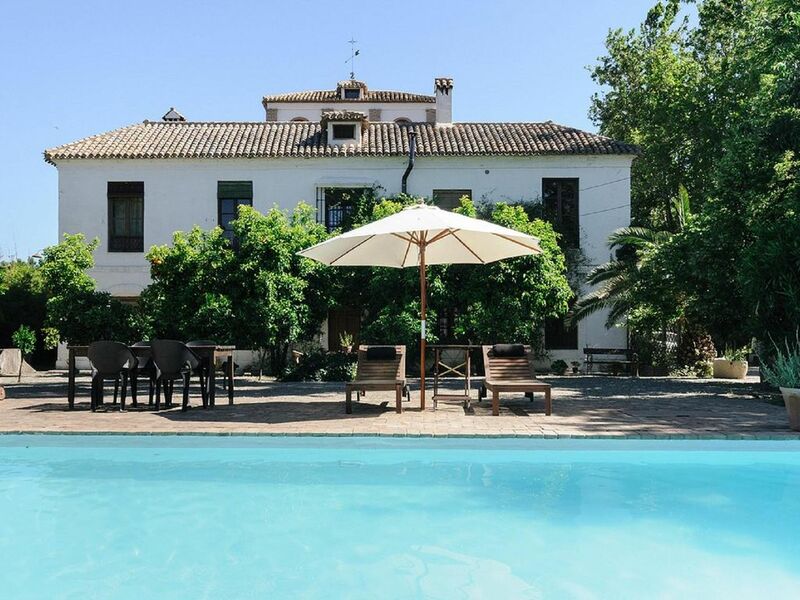 Our guests can stay in an authentic Andalusian farmhouse, close to the city with valet parking, swimming pool and a splendid garden. Access to the city by car is only a few minutes, but we also offer the possibility to use our bikes on loan to Granada for a bike path in just 15 minutes. In addition to the Alhambra and Generalife and all the cultural offerings of the city, nature lovers can enjoy the Sierra Nevada National Park, the ski etation Sol y Nieve or visit regions as emblematic as the Alpujarras or the Altiplano. For those who choose in spite of domestic tourism can not resist a day at the beach, the Costa Tropical is about 60 km further to visit, Almuñecar, Salobreña and Nerja. Solamente podemos asegurar la disponibilidad en el momento de la consulta.